A “dash cam” (dashboard camera) recently caught a shoot-out at a busy Florida intersection, as reported by CBS FOX 59 News. Two people exchanged 10-12 rounds from handguns at a stopped light in Escambia County. While no one was injured, there were two children in one of the vehicles. One suspect is in custody, while police are still searching for the driver of the other vehicle. Cameras are everywhere. They are in most people’s pocket, on car dashboards, and every other corner in large cities. Post-9/11, Americans’ fear of other terrorist attacks got the best of them and now, according to NBC News there are 30 million surveillance cameras spread out throughout the U.S., tracking our every move. 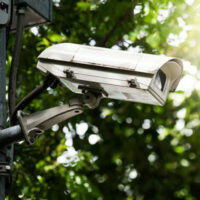 Do Surveillance Cameras Work to Solve Crimes or Keep Crime From Occurring? One study by the Urban Institute has shown that using surveillance cameras in Washington D.C. has a substantial impact on reducing crime, with no crime displacement (pushing crime that would have occurred on that street corner to another unmonitored corner). While these cameras are used in part to deter crime from happening in the first place, it is hard to say whether or not they actually help prevent crime due to a lack of further study. Generally, crime is more directly tied to current economic and political trends in a given area, not surveillance. And, with so much blind trust put into video footage, there is much at stake by using surveillance cameras and other low-quality or partial footage of events to dictate a person’s innocence or guilt. Is it High-Quality Evidence, or Just a Grainy Image Showing Partial Events? Can the defendant’s features actually be made out in the footage, or is there merely a vague resemblance? Does the footage show any crime happening, or does it just place the defendant near the scene of the crime at the alleged time that it took place? There are many instances when video surveillance and smartphone footage does portray events accurately and positively identifies the defendant correctly. However, many times video footage is taken out of context or is of such low quality as to be rendered useless. The experienced West Palm Beach criminal defense lawyers at the Skier Law Firm have successfully handled all types of criminal cases. Reach out today to schedule a free consultation and to begin on your defense at once.